Every guitar player should try playing bass. It’s a blast, and can really teach you something about fret stretches, silencing adjacent strings, and serious hand-strengthening. In another note, every bass player has to have a place to start. Sometimes getting a low-cost bass doesn’t mean having to get a cheap bass! Jazz Bass, J Bass… You say Fender, I say Phendre. Free Shipping and more information about Squier by Fender Jazz basses – The Affinity 4-string Jazz is available again!! Look at zZounds.com for great prices and guarantees! For folks with small hands or less-than-average arm lengths, a full-scale bass like this might be a little tough to play (especially during quick, challenging passes). If you’re not comfortable with a long, 34” guitar, I recommend trying out the Squier Bronco, Squier Mustang bass, or, if your budget can accommodate, a Fender Mustang bass. Features: The appointments and features of the Squier Jazz Bass are good for this guitar’s price. 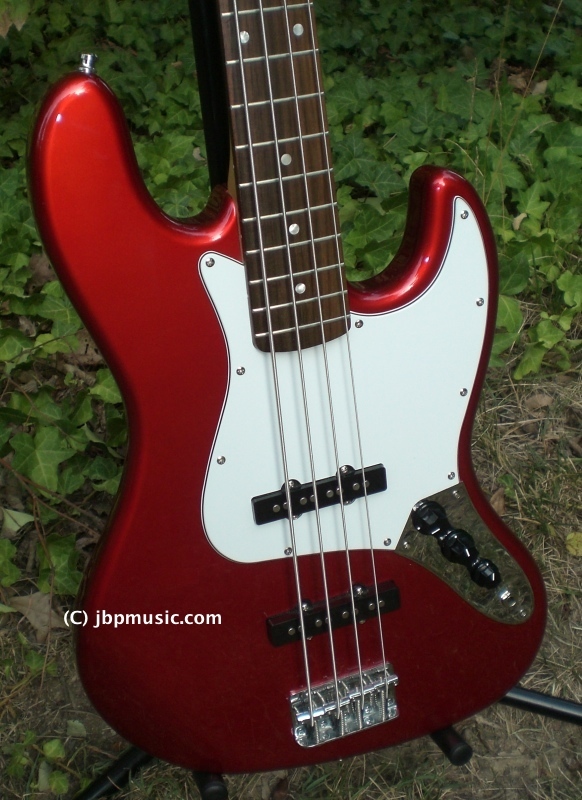 The pickguard is a well-made three-ply plastic guard (white-black-white on our Red Metallic bass). The pickups are two “vintage-style” pickups (bridge and mid). The guitar features two larger volume knobs and one smaller tone knob. The two volume knobs allow you to choose the tonal variety by selecting the volume for a specific pickup. The tone applies to the entire sound output (the Squier Jazz Bass guitars are passive, in that they have no equalization or boost electronics or batteries on board). As with pretty much every Jazz Bass guitar, the Affinity’s neck is bolt-on. In the case of the Squier Jazz Bass, the neck truss rods are adjustable via an allen wrench in the headstock (no need to unbolt the neck and unscrew the pickguard). 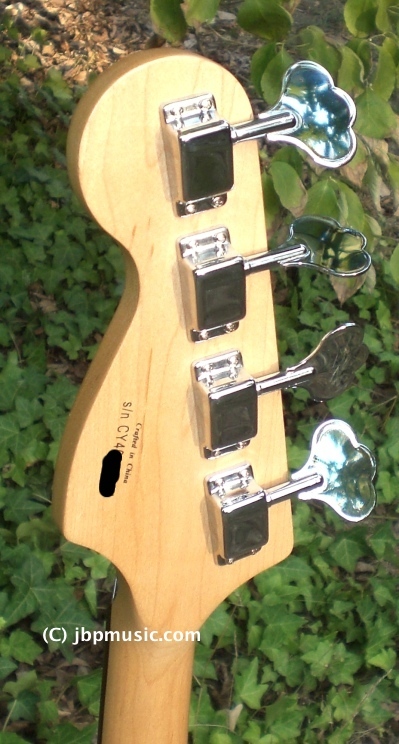 The chrome tuners are the enclosed variety, and are fairly accurate – I do like the “open gear” variety used on the up-scale Jazz basses better, but these do hold pretty well to normal play styles. The Squier Jazz uses a round string tree in the headstock for the two highest strings. The Squier Affinity Jazz Bass has top-loaded strings (means that the strings are not fed through the body, but are fed through the end of the chrome bridge). Sound:The Squier Jazz Bass guitar has a consistent, vintage sound. The pickups are pretty noisy – a bit more so than standard Jazz single coils, and the output isn’t very strong. The quality of the sound that does come out is all Fender, though. With the right amplification and EQ-tweaking, you can get the Squier to growl, rumble, and thumb-slap-“splank” without too much trouble. If I was to make this guitar my full-time bass – I might take the time to upgrade the pickups to Fender SCNs, or some type of high-output noiseless. Value: This is a $299 guitar in value (not ‘retail’, ‘street’). The sound, quality of make, and appointments are good. Many other low-end guitars have badly twisted/warped necks, poor sound, and extremely cheap parts – the Squier Jazz Bass is very much a cut above the average low-end bass (no pun intended!). You would have to buy a much more expensive Fender bass to get better sound. Wishes: I really wish these were offered with maple fretboards (a matter of personal preference, yes, but still something that would be good to offer). The pickups really should have more output. I wish these had more consistent necks and more consistent fret-finishing. These should all come with open-gear tuners – I don’t think Fender will lose much (if any) money on using nicer tuners. This entry was posted in Bass Review, Electric Reviews and tagged affinity, bass, beginner's bass, electric bass, fender, guitar, jazz, squier by Jim of Vivid Peace. Bookmark the permalink. I just bought an affinity j bass, private sale, paid $160. What a nice surprise, sounds and plays great,deep purple finish is beautiful , a 2010 model, open tuners, and I love the neck! My other bass is a 1971 P bass, in a blind listening test or recording, I don’t think most could tell them apart. I plan on adding a tortise shell 3 ply pick guard and upgrading the strings. Fantastic sound and value, undervalued to say the least! I got a good one for $100.00 plus shipping totaling $132.00. It has open tuners. S/N#: CY140709816, Black finish with three layered pick guard in white. I like it. I’m not a pro and I play a guitar mostly so the bass is just a diversion. It’s all good enough for me. I don’t really go out much in public to play. It’s used and has a few belt buckle nicks that don’t bother me at all.